Hola Chicos! Here I am, reporting from Peru. Arequipa to be exact. I always said I'd never have a blog - a travel blog no less! But so many people said they'd actually read it, that the peer pressure got to me and I gave in. In reality, probably only my mom and aunt will read this blog (Hi Mom and Nanny! ), but that's cool. So you may ask, "why vagabond 2.0? what happened to 1.0?" Well, Vagabond 1.0 occured 5 years ago when I uprooted my entire life to spend 3 months in Australia. But that ended up being kind of disasterous and I swore I'd never do it again. However, I'm not the type of person who learns from her mistakes. So here I go again.... I quit my job, moved out of my house, and left my country to explore South America all by myself! I've now been in Peru for 8 days, and I've learned so much already about the culture. I've picked up spanish quite rapidly (so far I can comprehend most things but still have trouble constructing sentences), and I've developed an extreme appreciation for fresh, clean water. Basically everything I miss about the USA so far revolves around water: drinking fresh water from the tap without fear of parasites, taking hot showers (the warmest shower you can get in Peru is tepid, to say the least), toilet seats, and toilet paper. The things I like about Peru so far: everyone is so kind and helpful here, and the exchange rate. Everything is so cheap! At first I was concerned because 20 soles for a night in a hostel seemed like ALOT, but after doing a little math I realized it only cost about 7 dollars! Amazing. If only my backpack wasn't already full so I could take advantage of the ample shopping opportunities! Downtown Arequipa near the Plaza de Armas is a GREAT place to go shopping. At first, I had a bit of trouble making friends because the hostels in Arequipa are not very social. But then someone pointed out that I'd only been in Arequipa for two hours! I was completely alone for about 4 hours before I had a group of friends. 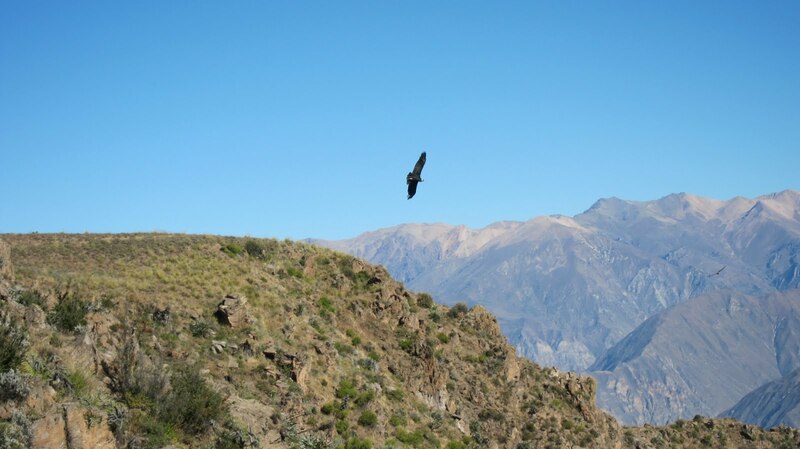 :) Over the weekend I signed up to go on a 3 day/2 night trek through the Colca Canyon with my new friends - there were about 11 of us. This canyon is about twice as deep as the Grand Canyon. Basically the entire trek felt like summer camp. 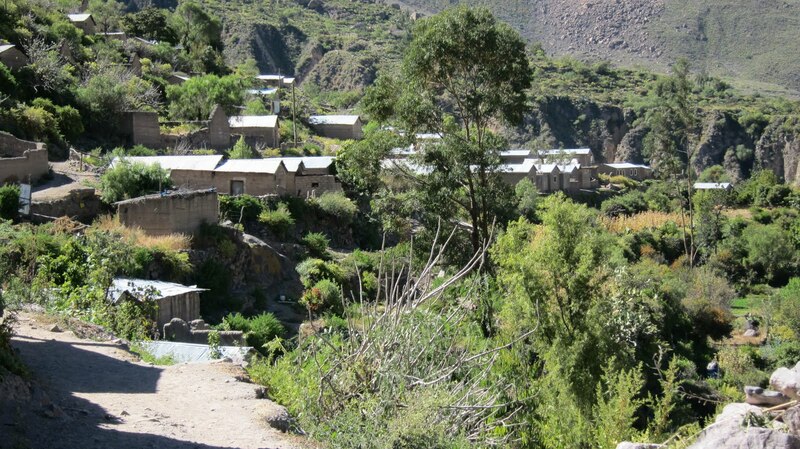 We were picked up at our hostels at approximately 3am and drove in a bus to a little town called Cabanaconde. After breakfast we drove to a site called Cruz del Condor to check out the condors. That day we hiked down the canyon to a little village called Cosnirhua. It was basically as third-worldly as you can get, which I strangely prefer over cities. We cooked dinner in a rustic kitchen with guinea pigs living in it! Amazing! 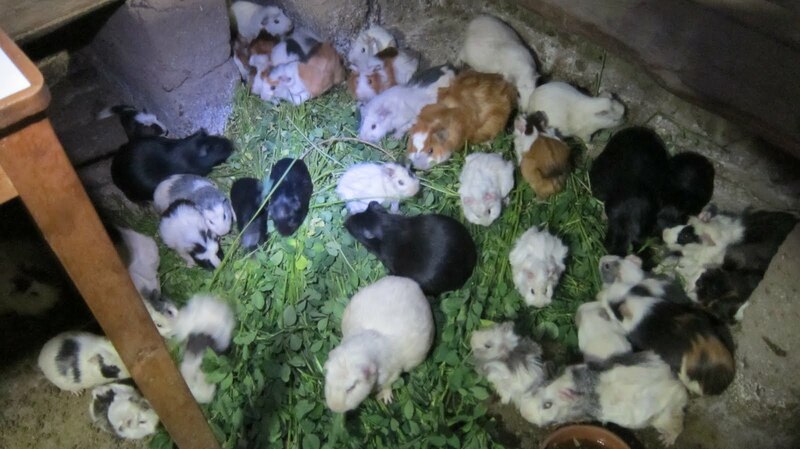 The guinea pigs "cuy" live and reproduce in the kitchens and when the people get hungry they simply pick one out and cook it. I was made fun of alot for bringing the smallest backpack ever on a backpacking trip (there is 3 liters of water in that tiny pack). But during the trek back up the canyon, guess who felt awesome?! In Peru, I am an ecologist. And in this role, I can't help but assess the land use. I am impressed with the Incan terraces for agriculture which the local Quecha people still use today. Equally impressive is the stone irrigation channels which feed the terraces. Colca Canyon is crazy steep but I observed very little erosion due to terracing. Maybe the grape growers in California could learn a little something from the Incas! The erosion I did see was related to the newer roads (for mules and donkeys - no cars allowed) and trails. There were also a plethora of "borrow pits" (mini quarries) because pretty much everything is made from stone and dirt. I was stoked to see a type of paddock grazing which I'd only learned about in rangeland class and had never observed. I also saw some old friends (and enemies) here... purple lupine, eucalyptus, and pampas grass! 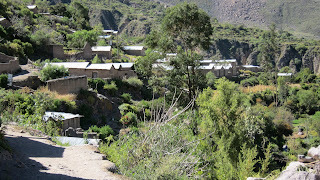 After I returned from the Colca hike I went to live with a local family. They are probably the most posh Peruvians ever, although they are an elderly couple. Every morning they cook me breakfast, I go to school for 4 hours at La Casa de Avila, I return and they make me lunch, I go walk around the city with friends, come back to their house when it gets dark to have tea with the family, do my homework, and go to bed. A pretty low-key lifestyle. 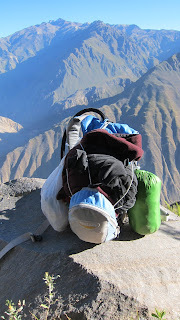 Tomorrow I embark for a 2-day backpacking trip up Volcan Misti. I find this hilarious because that was my former boss's name. 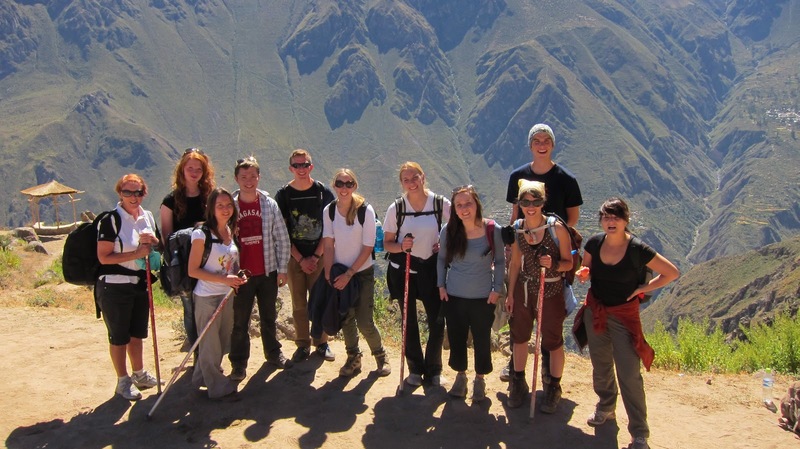 When I return I have two more days left of school before I catch the bus to Cusco! Note: I was supposed to go to Lake Titicaca next but the Peruvian side is shut down to travel because of strikes due to the recent presidential election. The government wants to mine the Puno area and the locals are protesting. Go locals! Mining is TERRIBLE for the environment, especially in an area with such magnificant natural resources as Lake Titicaca. Sounds like you're having a great time! Enjoy!